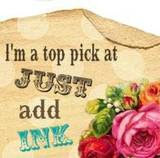 When I am just can't find my stamping mojo I look to the Stampin' Up! catalogue for inspiration. There are so many gorgeous samples that sometimes the hardest decision is which project to copy. The Supply List for all the projects is available as a seperate document now instead of being in the back of the catalogue. The advantage to this is that each project has a thumbnail picture together with the supplies. Click here to download your copy of the Supply List. 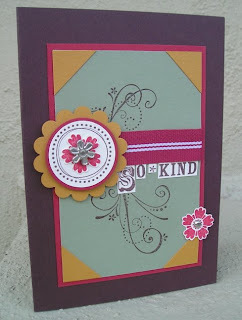 My "So Kind" card is a CASE of the card featured on page 92 of the catalogue. I have reproduced the card exactly but this card would look great in different colour combinations too. The Flower Designer Brads add a special finishing touch. I have a product share available for the 4 different designs of Designer Brads. Each share is $11.25 and contains 2 of each brad. See page 138 of the catalogue for samples. Free Monthly Scrapbooking Class Anyone?